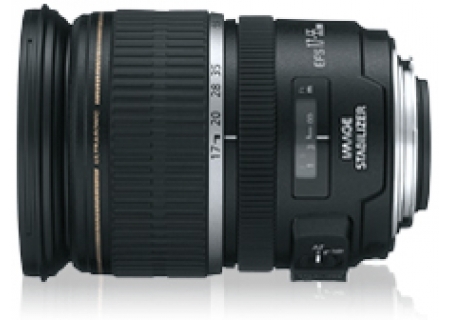 The EF-S 17-55mm f/2.8 IS USM Lens from Canon is a large-aperture lens compatible with APS-C format digital SLR cameras, and offers a versatile wide-angle to short telephoto zoom range. The focal length is equivalent to approximately 27-88mm in 35mm format and its constant f/2.8 maximum aperture is effective in low light throughout the zoom range. A wide maximum aperture also enables shallow depth of field control. This lens features Canon's optical Image Stabilizer technology, providing up to 3-stop compensation for image blur caused by camera shake at slow shutter speeds. This enables clear images, even in dim light. An ultrasonic autofocus motor (USM) provides fast and quiet AF action which is particularly important when shooting video and manual focus override allows precise manual focus at any moment, even in autofocus mode. Designed specifically for digital photography, the lens has specially shaped lens elements and Super Spectra coatings to suppress ghosting and flare, which can be caused by reflections off digital camera sensors.